When I see something I can make something out of, I get a flash of excitement, imagining all the cool things I could make. Usually, reality sets in shortly afterward, but it’s great while it lasts. That little darling represents a whole lot of work; its assembly has been an ongoing project for several weeks, now. First, I took a 4 bars of victorian wrought iron from my precious supply of vintage metal. Then I used the bandsaw to cut some appropriately-sized chunks of 1/4″ 1095 high carbon steel. Then, I finished re-working my respirator because the wrought iron is covered in lead paint, and I spent maybe an hour grinding the surfaces free of mill-scale (on the 1095) and paint and corrosion on the wrought iron. After that, I can use my mig welder to hold it all together so it’ll survive in the furnace long enough to get to welding temperature. More experienced knife-makers told me I’m nuts to experiment with wrought iron and monosteel laminates, but I love how it looks so I’m going to keep trying. Besides, part of the process is doing things the hard way, deliberately. You usually end up trimming the ends of a block, so it’s not necessary to clean them up; that stuff will get bandsawed off and added to my collection of goobies. I’ll also (eventually) grind out the material from the mig welds. From there, it’s into the furnace for a 15-minute soak in 2300F burning propane. Wrought iron is particularly difficult to work with because it gets crumbly at anything below welding temperature. The whole time you’re working with the stuff you need to keep it screaming hot; that just adds to the challenge. I usually don’t have good pictures of the process of drawing out the bar, because, really, do you want me messing with my iPhone with one hand, holding a bar of yellow-hot steel with the other, and operating the press with my third hand? Fortunately, the press has a foot pedal, too. Usually, I don’t use the foot pedal because it puts my leg in the fall-path of a yellow hot steel bar, should one happen to get dropped. I’m not much of a hammerer; I don’t do all my welding (obviously) with a mallet like some do. I believe heavy effort is what hydraulics are for (thank you, Archimedes!) but the day after one of these sessions, my hands and arms ache something awful. Why? Because I am gripping those tongs together like I’m holding on to a door and the Titanic just sank out from underneath me. The photo above gives a good view of the press’ die. That’s the swappable jaws of the thing; it can hold a variety of shapes formed from tough S7 steel (the levers are the screws that control releasing the dies) I have a couple of dies including some that are just flat/square and others that are mostly round. The round part is used to swage the metal – to push it in both directions away from the center. The flats are used to squish it and shape it. This combo die is pretty nice, though it’s a bit tight and tends to constrain me to 2″ width bars. So, to form a bar, you alternate between using the rounded edge to stretch the metal or the square edge to flatten and form it. I actually do almost all of my work with the square end, since even the square end stretches the metal when it presses down. You just walk down the bar, smoosh, smoosh, smoosh, smoosh, smoosh. Then you re-heat it, turn the bar over and do it again. Sometimes you do the smoosh on the edges by holding the bar upright, and sometimes it gets a bit curved so you put it on the anvil and correct it with the hammer, thunk thunk thunk. Hot steel does not make a “bang” noise when you hammer it, it makes a “thunk” noise like hitting clay. 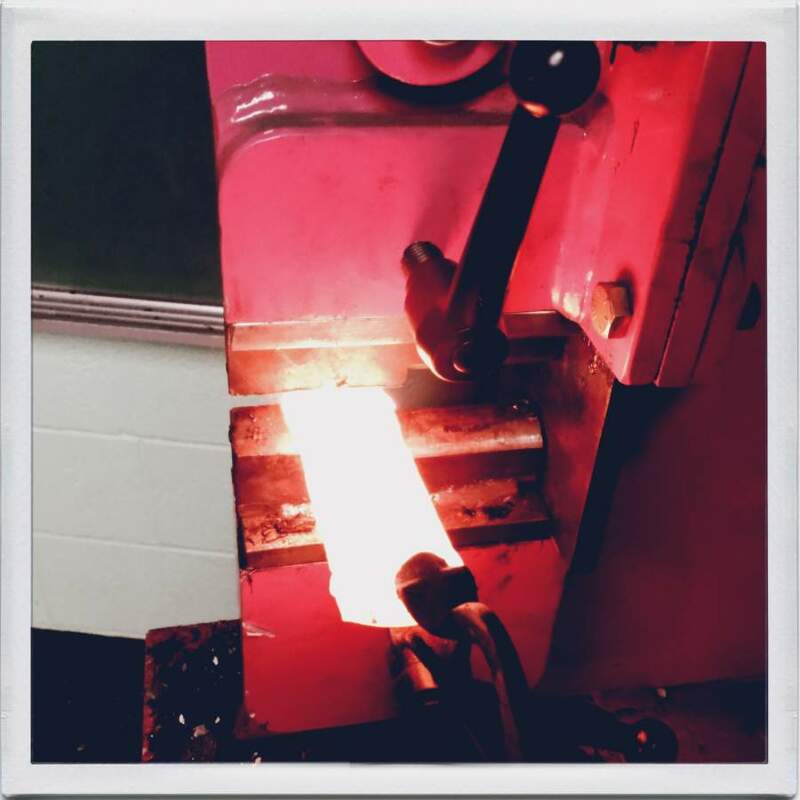 In fact if you have any experience with pottery clay or plastecine clay while it’s at the “stiff and reluctant” stage, that’s about what yellow hot steel feels like to work. It takes about 6 passes through the oven and press to smoosh the block out into a bar. Once that’s done, you stick the bar into the annealing tub (a 25 gal garbage can full of pearlite) and put the lid on, and let it cool down overnight for the next day. The next day, you brush it off, look for cracks and trim the ends off with the bandsaw, measure the length, and decide how many pieces to cut it into. 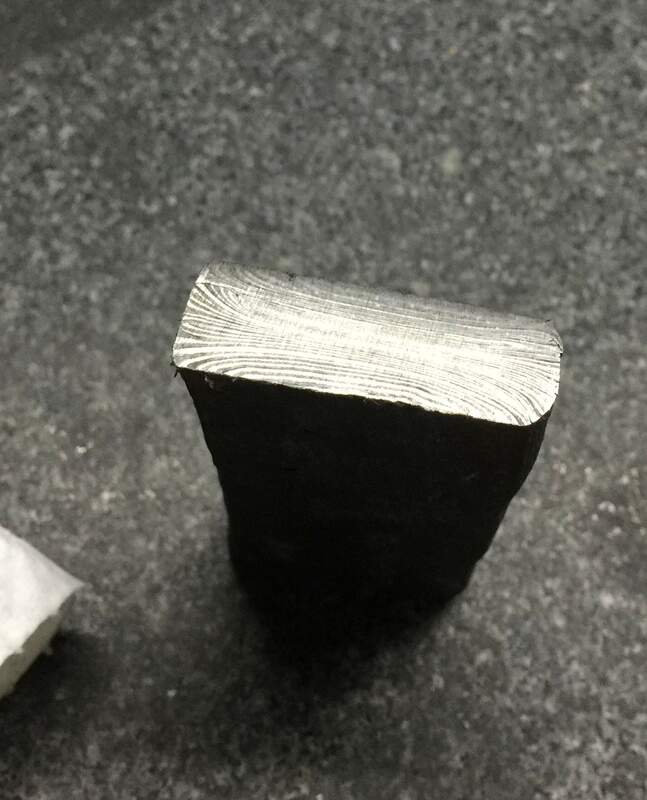 The first pass of this bar was 9 layers of steel, which produced a bar that I cut into 8 pieces – the bar resulting from that would be 72 layers. Not enough! 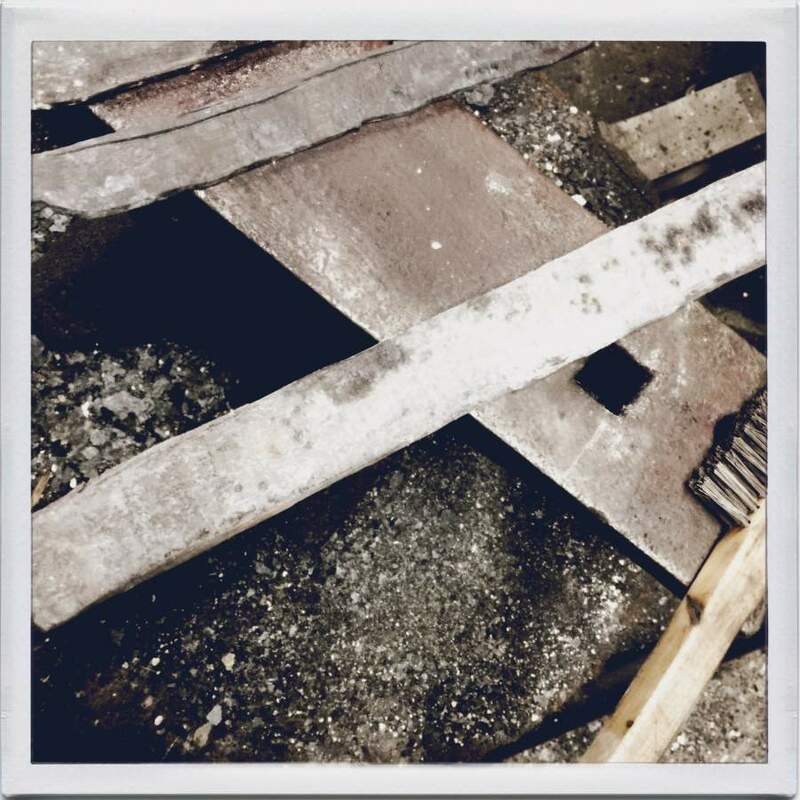 The bar’s surface gets cleaned up of scale and oxides with a mix of angle grinders carrying grinding wheels and angle grinders carrying flap wheels, which is a nasty process that takes about an hour and a half for a bar that big. Then, it’s over to the bandsaw to cut it in pieces again, mig weld them into a stack, and it’s ready for another run through the furnace! Stage two of cutting and stacking resulted in 6 pieces, so the bar came out at 432 layers. That’s the piece you see in cross-section at the top of this posting. I don’t know about you, but I find it fascinating and weird that I can build complexity into a piece of metal this way. It’s doing what I want it to do, but it’s a dialogue between me, my tools, and the steel – a dialogue mostly consisting of curse-words. Now, I have 4 pieces like the one at the top, and the next pass is to turn them into something that I can try to turn into a knife. I think I will attack it by working on the pieces as pairs, so that big stack will result in two pairs of small bars that will get turned into stock for a blade. 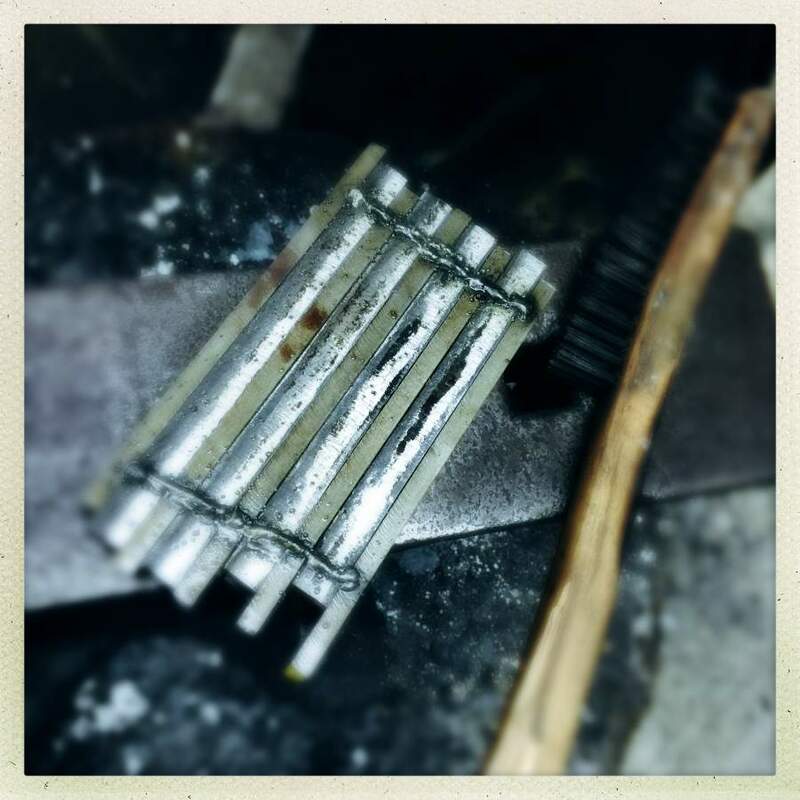 Each pair will probably work out to be enough metal for two blades so – if I am lucky skillful and don’t screw up, I’ll get 4 blades out of that great big stack of wrought iron and 1095. I may see if I can get some thin 15N20 stock and put a thin layer of 15N20 on either side of the central 1095 bar. That would look really spiffy. But it might be too dramatic. Another possibility is to take a sheet of pure nickel and sandwich the 1095 with that. The nickel welds pretty well and sort of melts into the surface of wrought iron, so it makes for some very beautiful and dramatic patterning. By the way, the more dramatic you get with the layout of your bar, the more obvious it is if you make any mistakes in your grinding. Life’s that way. A lot of the drama in the metal gets exposed automatically as you shape it. As Michael Bell says “the blade reveals its nature as you work on it.” That’s a great way of explaining it; you slowly come to know each piece and its unique fingerprint. Another trend, which I am probably going to have to experiment with someday, is to make the bar square-shaped, then cut it into shorter pieces and assemble them edge-up as tiles in a mosaic. For example, I could take that bar (if it were square) and arrange the pieces in a herringbone pattern. It’d look like something. The more you do that sort of fancy welding the more metal you waste, the more time you spend, the greater the chance of making a mistake. That’s one reason the big-name professionals go out of their way to do these complex weld-ups: it shows their skill. I don’t think it makes much difference to the quality of the blade, but you can stare in awe at the amount of effort that went into it. On the picture above, see the spot in the upper left hand corner, where the line at the edge is visible? That’s a spot where the weld didn’t take. It’s OK because it’ll probably be ground out, but if I screw up and place that spot on or near the edge of the knife, the knife goes on the Shelf of Shame and Glory. That looks fantastic and very promising. The picture of the bar getting ready to be smashed by the press made me gasp out loud – – in fear, mostly, but also amazement. That would scare me to do that and I too would be afraid of dropping it on my foot (totally something I would do) and I too would have a death grip on the tongs. That is incredible that you’ll be able to put the cutting edge of the blade on the different steel you put in the center. It’s kind of cool how the layers stay more or less where you want them to. I would think the heating and smashing would move them around a bit but maybe not. I should have mentioned – when you tack weld the bar together, and put it in the oven, it comes under huge shear stresses if it heats unevenly. Add to that, the different expansion rates of different alloys and sometimes the mig welds just pull right out of the steel. That’s why a lot of the time you start with something block-like and “draw” it out into a longer bar. By the time it’s welded and ready to draw it’s a single piece of metal. I had a lengthy text message discussion last night with another smith, around exactly that problem. So: as you squash the layers thinner the “action” in the metal is more visible but you can lose track of the piece of metal you wanted to form your edge out of. I did some back of the envelope estimates and it looks like you need to place the edge correctly and grind down to it with about 1/1000th inch accuracy, or the edge goes all over the place like in the problem child knives. 1/1000 is pretty precise, for a hammer! My friend asked a famous knifemaker he knows and the response was really interesting – the guy counts the hammer blows he drops on each side. Yipe! It makes sense, though – if we are looking at 1/1000 inch differences making those patterns, a hard hammer-blow ought to move the metal 1/32″ maybe – the hammer-mark would look like a crater along the edge. This may be one of those “get good” problems. I’m still rattled by the idea of hammering with milling machine tolerances. If anyone wants to check my back of the envelope estimates, we’re in the unusual situation of taking a 64-layer (or whatever) bar 3/8″ thick and sandwiching a 1/4″ bar between 2 of those then smashing them all down to anl 3/8″ thick bar and then grinding that down to 2 long bevels at, say, 10 degree angle – then you have to locate the “sandwich meat” onto the edge. What’s tricky about this is that all the dimensions change each time you whack it. Anyhow, I think that “hundrededth” to “thousandths” is the scale we are working at. It’s not machine shop precision, but damn. If you’re a rookie, and they say you’ve got potential, that’s a compliment. If you’ve been around a few years and they still say you’ve got potential, that’s no longer a compliment. It is possibly an errant attribution, but I don’t seem able to track it down. It’s something I heard on the radio ~ 30 years ago. @Marcus, #3: OK interesting. I do count my hammer blows when cold forging. But it sounds like I am getting a “slower” movement in the metal. Of course I try and use that to my advantage and try and get the metal to move where I want it to. But I will be the fist to admit it’s a somewhat serendipitous process. There are those days when Things just take over and you can’t seem to get anything to happen right. I can see why a lot of japanese knives are a piece of mono-steel with pattern welded steel forge welded onto each side. Would make sorting out the edge so much easier. do you want me messing with my iPhone with one hand, holding a bar of yellow-hot steel with the other, and operating the press with my third hand? Obviously you are a very smart person and already know the answer to this, but I’m rather disappointed not to see your third hand in the subsequent photo. Also there is no such thing as too dramatic. It’s also a matter of efficiency. The steels the Japanese use in the edges of cutlery are expensive and hard to come by. The original Japanese blade-making tradition involved laboriously smelting steels from iron sands, only the best of which were considered good enough to form the blade’s edge (tamahagane or “jewel steel”) There were probably also wartime shortages during the period in which current practices were established. you’ll see that they use fairly small pieces of high carbon steel to form the edge of a knife that is otherwise based on an iron body. That’s strong, and it saves metal. It’s also easier to work: win, win, win. At around 10:42 you’ll see the smith setting up to weld the high carbon edge onto the softer metal blade body. These Japanese smiths are so experienced and have such steady hands that they don’t bother with all the stuff modern blademiths do – they just use snippers to chop the thin piece that will form the edge, place it in position onto a near welding-temperature blade body with some flux – all just pushing it around with a poker – then pop it in the oven to bring it to welding temperature and >tap< one hit and it's welded. Practice, practice, practice! Actually, this sort of technique is very repeatable and, once you've done it a few thousand times, I suspect that the smiths are in "the zone" and are barely aware of what they are doing. It just happens. There are modern smiths that do this, too. Take a piece of body material, which might be a composite of old car leaf springs and some junkyard stuff, then drop in an edge of high quality damascus. I'm at the point where I can do that but it's hard. I’ll do what I can next time. There’s “got 10 million hits on failblog” dramatic. I think it’s pretty, and the shot of the hot metal is beautiful, that colour is so warming. But yeah don’t drop it.